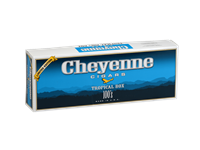 Cheyenne Filtered Cigars – Great Flavor at a Great Price! 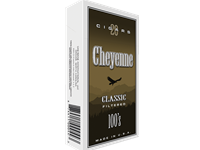 Cheyenne Filtered Cigars are the original filtered cigar. They started it all, and they continue to offer a great line of filtered cigars for smokers around the world. Because of their high quality, low price, and continued introduction of new flavors, they are one of the most popular brands of little cigars in the USA. Even the packaging is quality, rigid and sturdy, the pack will not fall apart in your pocket or purse, and is a welcome change from many brands that come in flimsy packaging. The design is simple enough, a bright color (different colors for all the different flavors) with an eagle in flight near the center. But hey, a lot of us don't buy filtered cigars to admire the box, we want to smoke those things! The tobacco in Cheyenne Filtered Cigars is premium quality, and it show in spades. Years of producing this product has allowed them to refine their blend and processes, and wow does it make for a damn good smoking experience! They are a rich, yet medium bodied, filtered cigar with a very pleasant aroma that lingers just long enough to enjoy, but not long enough to annoy. You would be hard pressed to find a better discount filtered cigar! 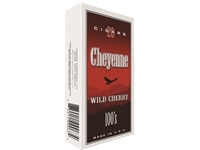 Sold nationwide since 2004, Cheyenne Cigars have revolutionized the cigar category by providing filtered cigars that are high-quality and full of rich flavor. They are available in a variety of styles with 20 cigars per pack and 10 packs per carton.